Lambing commenced on May 11th, and as of yesterday, 90% are done. This year there are 100, including 30 ewe lambs, and I’m enjoying a little breather before the final blast. So far, the lambs are extremely healthy, although the percentage is way down – in fact the worst I’ve ever experienced. I credit that to having put up garbage hay last October and overcrowding in the breeding pens. The flock and I are making a serious transition to total pasture lambing and I can say that there are a few things that anyone contemplating this move should NOT do. The reasoning for the change seemed logical at the time. I was totally out of decent corral space and have plans for increasing the flock size over the next couple of years to at least 400. I had done some research on pasture lambing and decided it was worth a try. It’s a bad habit on this place to forge into a new venture without the basic structure in place, and this year’s lambing was no exception. This flock has access to 800 acres – of which 600 are bush – no fences. I had thought that a few main areas would have been fenced this spring but the frost didn’t come out in time to pound posts, so there I was with ‘free form lambing” happening everywhere. It’s a mile and a half to the west end of the property, and that seemed to be the chosen area for most of the older ewes. I tried moving a couple of families in a little closer to civilization, but that was severely resented and I gave up. 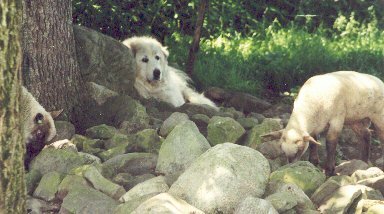 The two senior guarding dogs took over and worked out a schedule for themselves so that the new families ‘way out back’ were watched over until they moved themselves in closer to the home quarters. 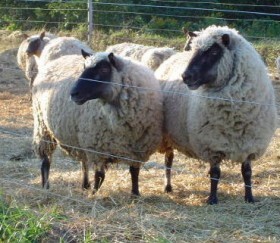 A main objective of developing a pasture lambing flock is encouraging self-sufficient ewes that manage without human interference. That concept somehow has to be melded with the need to perform basic identification of lambs for performance recording and proper purebred records. Clun lambs are noted for being up and going very quickly and the upshot of that is that if I’m not there in the first three or four hours to tag, paint brand, etc., catching the little beggars turns into a foot race of frantic proportions. Lambs have a ball and the ewes are not impressed, and I’m gasping for air, thinking I could be a candidate for a heart attack. In a shed lambing situation we can do what is required at our leisure and I used to be very conservative about waiting at least a couple of days to process the lambs. now the time period has been reduced to waiting until they’re dry and have a bellyful and then getting them before they can out-run me. I have learned that they take the handling much better at four hours than at a couple of days, especially for docking and castration. I am trying to be very disciplined in practicing non-interference in order to select the best candidates for pasture lambing and I think that this is the hardest part of the process. There are a few ewes that I have helped along over the past few years and it is my nature to give them the benefit of the doubt, and this year is no exception. Those few that need a hand getting lambs started are being helped, but with the knowledge that they’ll probably have to find a new home with a farm flock. Very difficult after having raised them and watched over them and their offspring for several years. On the other hand, the ewes that have their lambs and carry on with no attention from me are very noticeable and actually do better than in a confinement system. For pasture or shed lambing in the late spring I really like to see the girls sheared before all the excitement starts. Northern Alberta has very few shearers available and it’s akin to an Act of God to get them here. For the second year in a row, the ewes are still in full fleece at lambing time and it probably bothers me more than it bothers them. I’ve never had a problem with lambs getting started on an unshorn ewe, but we do get some freakishly hot weather at this time of the year and I feel for them. I’m pretty much stuck with waiting for lambing to be over before begging and pleading for the shearer to come. I had thought that the ewe lambs were going to be a nightmare on their own in the wide open spaces but they have surprised me. So far, only two needed any attention at all. A couple needed a few hours of quality time with their lambs inside a portable pen and then they were on their own. A couple had twins and needed no assistance from me. I had picked a flock size of 400 because I felt that it would be able to replace my town paycheck. For one person, pasture lambing is really the only way to look after that many ewes alone. In many ways, Cluns are ideally suited to this style of management. In reality, the purebred flock will probably be held to 100 to 150 and the rest will be F1 hybrids developed to adequately support me and provide good examples to the commercial shepherds wanting to purchase purebred Clun rams. The purebreds in a pasture environment should make for some high quality and truthful advertising for commercial flock owners looking for a maternal sire breed. Most of my Targhees, which I got to produce crossbred lambs, have produced good quality twins, with most of them being female – which makes me very happy. The sire of those lambs, a purebred Clun, is an excellent ram, the first one that I purchased from Angus Rouse. That ram was retired this spring into a research project sponsored by the Alberta government for disease monitoring, so I’m glad to have many of his daughters in the flock. 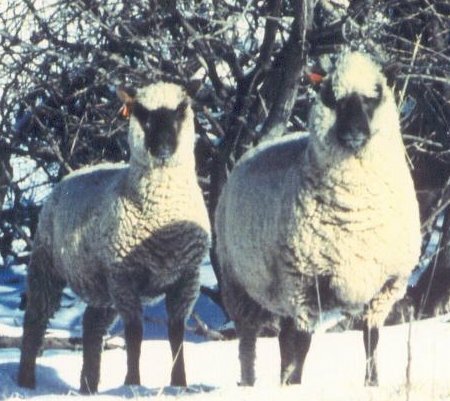 The Targhees themselves are not the mothers the Cluns are, and their only purpose is to produce Clun halfbreds where the Cluns have considerably improved the temperament of the lambs. The halfbred ewe lambs born last year are doing very well with each having a single and taking excellent care of them. One of my projects this spring has been to get in touch with all the commercial producers I’ve sold rams to in the past few years. Their comments follow an identical theme. All say, upon first seeing the ram lambs, “Gee they sure are small!” I have learned from that when selling from my own farm, it helps to put the lambs over a scale with the purchaser right there so that they can see in “pounds per square inch,” that these animals measure up and then some! When the animals have been purchased sight unseen, I strongly encourage the new owners to put them on a scale when they take delivery. At lambing time, everyone comments on how the Clun cross lambs are up so much faster, are so much hardier, and generally do better. A couple of producers have mentioned that the lambs seem small, and again, I suggest that they weigh them. I have also found here that the Targhee cross lambs look bigger, but that is deceiving. The scale tells the truth and the purebreds are always heavier than the crossbreds. Of the bigger commercial flocks that I’ve sold to, the owners are extremely happy with the halfbred ewe lambs that they have kept for replacements. They are using a wide variety of terminal sires and the results are always the same: excellent ewes raising top-quality lambs. Our spring has been dry, windy, and cold, with forest fires a real concern. This farm is located on a road that dead-ends between two rivers, and although I enjoy the isolation, the risk is pretty big some years. I guess that’s probably more than you wanted to know – I hope it is of some help to you.